It is the theme of ObjectBar which challenged first. 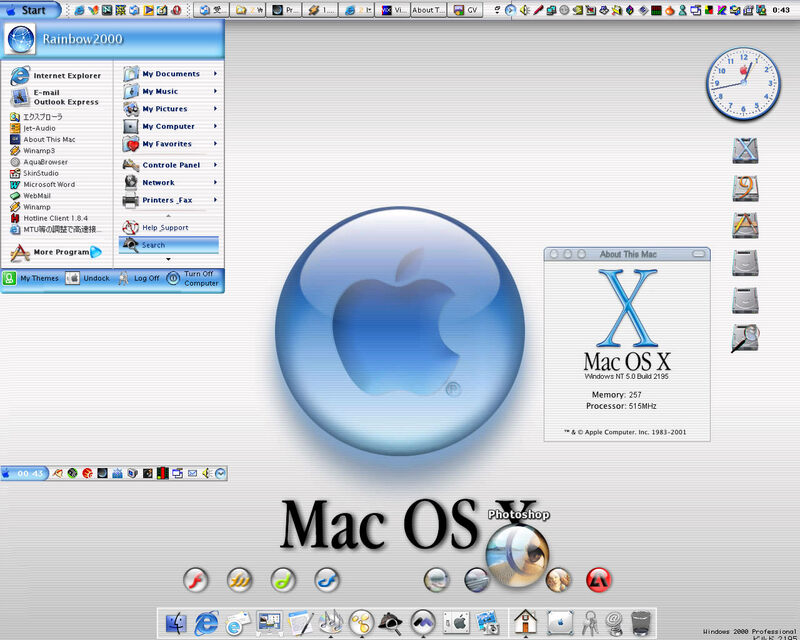 The design of Windws XP Luna and Mac OS X Aqua is taken in. A start button and some objects were corrected. Very nice. Is the the Aqua dock in the SS a DX object? The Aqua dock is the object of DesktopX. The dock object is a bit different than others I've seen. Is it posted somewhere? Link? Some objects are in AquaSoft.ORG. Moreover, some objects are in my homepage. The best i have ever seen!! thankx alot!! I love the objectbar, very nice and crisp. makes a great match with the OSXP windowblinds skin. I have a question though. what did you mean by "The Aqua dock is the object of DesktopX." Is there a way to import skins from objectbar to DesktopX or is that just a desktop X theme from somewhere else? Great Work. Please where can I get the wallpaper. You can get Wallpaper and some objects in my Homepage. How can I install AquaXP to WindowXP PC? Do I need to have Plus! Program be for install? What do you need to get this? I use windowblins but can't get this on windows XP..
Looks Great, however when I load it up everything under the start bar is in Japanese? Is this the way it's supposed to appear? Probably, I think that it is displayed satisfactory also in English. Otherwise, please report. NOW, TELL ME WHAT PROGRAMS I NEED TO RUN THIS BEAUTY, PLEASE!!!!! You need ObjectBar, DesktopX, WindowBlinds and IconPackager.These program is Stordock products. DesktopX object and WallPaper is created by me. Program launcher is Japanese program from "miki's Home Page".http://www2s.biglobe.ne.jp/~geoph/ This program's skin created by me.